Restorative Options for Missing Teeth & Endentulous Patients For patients with 1 or more missing teeth, but less than a full jaw of missing teeth (fully edentulous jaw or mandible) a dental implant is the optimal restoration. A dental implant enhanced the appearance of the face, helping develop bone and provides natural bone support for facial musculature and skin (especially around lips and the mouth), helping achieve a move youthful appearance for patients with missing teeth. A dental implant improves breathing and blood oxygenation, as opposed to removable that can block the natural movement of airflow into the body and even cause or exacerbate sleep apnea. A dental implant improves full mouth mastication (chewing) function by helping to evenly distribute pressure forces (during chewing) among the arches and equally among teeth, like natural teeth, unlike the options. A dental implant improves reduced wear of other teeth protecting all other teeth and increasing their longevity over the long term. A dental implant improves reduced wear of other teeth protecting all other teeth and maintaining the proper alignment and proportions of the smile, which is deteriorated and becomes less attractive when teeth are worn down. Superior long-term aesthetics are achieved by preventing a visible defect in the bone. An implant crown is more hygienic than a bridge because it is cleaned like a natural tooth and does not have food stuck underneath like a pontic bridge, partial or denture. Superior long-term aesthetics by preventing a visible defect in the bone as a result of tooth loss. Significantly reduced risk of periodontal disease formation at the surgical site of dental implant, due to bone and gum regrowth and continued support, versus bridge which typically results in poor hygiene, periodontal inflammation, disease progression, gum recession, and ultimately progressive bone loss. Dental Implants are the only restorative solution that prevents bone loss. Bone loss is an unfortunate side effect of tooth loss, which occurs because the jaw and mandible bone reabsorb back into the body, without a tooth root (or dental implant) stimulating bone growth. To explain further, “when you don’t use it, you lose it.” This concept indicates that when you have a normal tooth, you continuously experience chewing forces from grinding your teeth while eating food (masticating) which puts pressure on the bone and in return the bone provides strength and density. However, if an implant is not placed within 12 weeks after a tooth extraction and bone graft, the bone level will automatically start to diminish, weakening the jaw and adjacent teeth, alongside already injured bone at the extraction site. The ONLY way to prevent bone loss over the long term is to place a dental implant. In the image below, a 30-year-old woman has lost her molars due to an infection, and 2 scenarios are displayed. One where the patient chose to restore her mouth with dental implants, and one where the patient chose to wear a partial denture and experienced bone erosion of adjacent teeth until all the remaining teeth were gone as well over a period of approximately 10 years. Notice in the dental implant option, the woman’s facial structure, and bone remained the same over the 10 year period due to the dental implant preserving bone, facial structure and providing the proper framework for the face and TMJ joint. 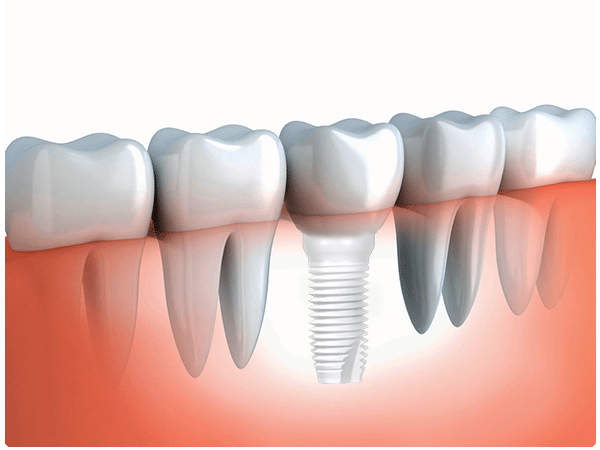 Dental implants provide a permanent and superior alternative to dentures, crowns, and bridges. They consist of three different parts: The Implant: This is a screw that directly connects to your jaw and acts as a root for your replacement tooth. In some situations, the bone may need to be grafted before the implant can be installed. The Abutment: Part of the implant that secures the prosthetic tooth. Crown: This is the actual prosthetic tooth. It is made of porcelain, zirconium, or another dental material and is prefabricated in a dental lab so that it fits perfectly with your natural teeth. The Ultimate Solution: Ceramic dental implants provide better aesthetics, a more permanent tooth replacement solution, and better biocompatibility than titanium implants, metal implants, dental bridges, or dentures. The beautiful, long-lasting, biocompatible, metal-free and superior by every measure dental implants that Dr. Yuriy May places have numerous uses for different types of cases including: Dental implants are incredibly versatile and can replace one tooth, multiple teeth or the full jaw. They are often the best permanent solution for people who have failing teeth and other dental problems. Additionally, this type of treatment has a very high success rate for patients, over 95% of dental implants succeed and for those few with complications, 99% succeed during the second dental implant procedures. Approximately 98% of implants last for the rest of a patient’s life, where root canals, bridges, and other replacement options typically need to be addressed 3 to 7 years down the road. Single Tooth Replacements: Dental implants can permanently replace one or more missing teeth while also preserving bone, the shape of the mouth, supporting facial musculature and shape of the face. 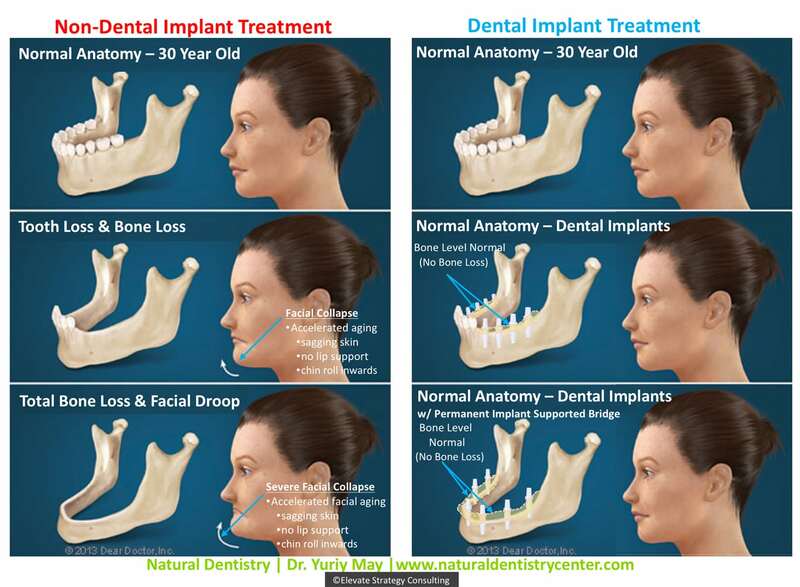 The dental implant will, over time, integrate with patients’ own natural jaw bone. This is called osseointegration, and ultimately the process stimulates the jaw bone, creating additional healthy bone growth which in turn combats bone loss and improves your overall facial structure, bone and tooth health. The crown, which attaches to the dental implant, will look and function just like or better than the patient’s own natural tooth, allowing patients to live, smile, laugh and rip through corn or steak with confidence. Implant-Supported Bridges: Dental implant-supported bridges permanently replace multiple teeth while preserving the overall bone structure of not just the tooth but an entire jaw quadrant, which significantly helps maintain the structural integrity of the facial musculature and bone, allowing cheeks to avoid sallow looks and sagging of the skin. Traditional bridges are supported by the adjacent teeth, which puts pressure on your formerly healthy teeth, loosening of them over time (referred to in dentistry as the “cantilever effect”) and causing the additional and unnatural force to exacerbate erosion of the health teeth, otherwise know as “grinding down.” This causes several long-term problems for the patient including bone loss at the site of the missing and implant-less tooth, excessive and unbalanced force on the adjacent healthy teeth eroding the bone and tooth structure, bacteria and food particles being caught under the bridge (empty tooth location) causing gum inflammation and generating unhealthy bacteria growth in the mouth, and ultimately, loss of the integrity of the facial structures in terms of musculature and bone due to the erosion of both adjacent teeth and the jaw bone where the former tooth had once been. 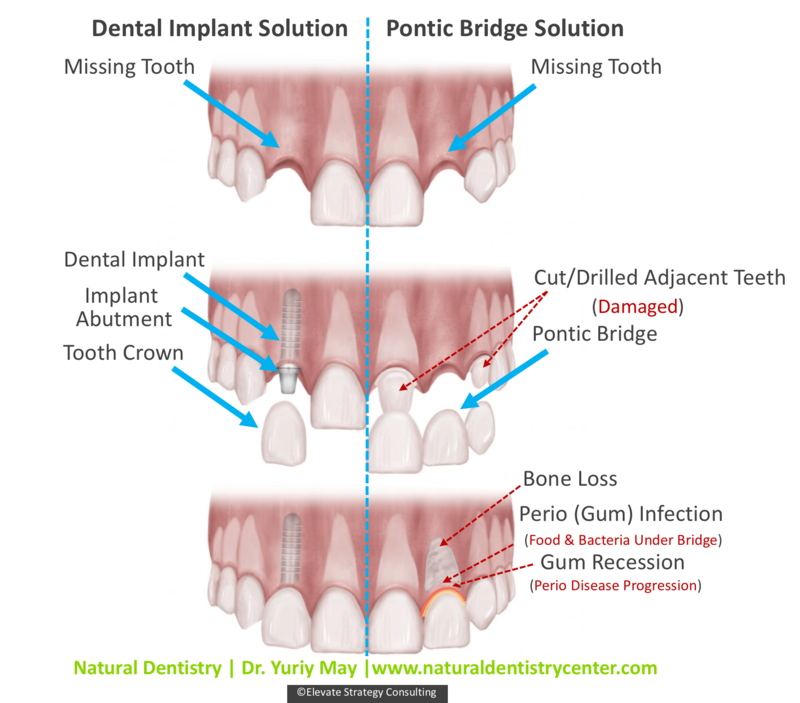 Unlike cantilever bridges, a dental implant-supported bridge is held firmly in place by the dental implant, and therefore bone growth is stimulated around the site of the missing tooth (now implant) and the natural pressure of the bite and chewing is equally and once again, naturally, distributed across the remaining natural teeth, preventing the healthy teeth from being damaged in the placement of the bridge. Additionally, the implants will stimulate the jaw bone growth, preventing bone loss and prolonging the preservation of facial musculature and bone structure resulting in a more youthful appearance. Full Mouth Reconstruction (Full-Arch Replacements): Dental implant surgeons like Dr. Yuriy May use advanced dental implant technology every day to permanently restore an entire arch of teeth (mandible or maxilla of the mouth) in one efficient, permanent and health-enduring procedure. As few as four dental implants can be strategically placed to support a custom arch of beautiful teeth that will absolutely redefine the shape of the face for both men and woman, making them look younger and revitalizing their entire facial structure. During excessive tooth loss that patients experience either due to disease, medications, physical trauma. During the procedure, a beautiful and high-quality temporary prosthetic will be placed following the initial procedure, but once your implant sites heal you will receive your gorgeous, zirconia, custom designed, natural looking celebrity teeth that will allow you live the life your dreams – eat all the grass-fed, pastured, grass-finished steak or quinoa and organic corn your heart desires, while wearing the gorgeous, million dollars, never go out of style smile. Your incredible zirconia dental implants have a lifetime warranty from Dr. Yuriy May and you will realize, life would have been better with your fully restored arch if you only did it 30 years ago! Orthodontic Anchorage Devices: Dental implant specialists like Dr. Yuriy May often work hand in hand with functional orthodontists to use dental implants as anchorage devices to move surrounding teeth for palate expansion and other uses, including the ALF (Advanced Lightwire Functional Appliance). After Natural Dentistry’s oral surgeon places the dental implant, a functional orthodontist various hidden devices to the dental implant and surrounding teeth. Having a stable anchor tooth allows the surrounding teeth to move into place faster to achieve the ideal mouth opening for aesthetic, breathing and functional objectives. Dental implant surgeons like Dr. Yuriy May continue to find new and inventive ways to utilize dental implant technology, and Natural Dentistry has only described a mere few of the most popular uses for dental implants. With all of the treatment options available, Dr. May is confident and committed to identifying the optimal, health supporting treatment that fits even the neediest patients’ needs, either with dental implants or other restorative solutions. All bone grafting materials that Dr. Yuriy May employs in the practice have been hand selected through decades of research and are by design considered the most natural, effective and of course, premium materials available on the dental market. All the below grafting material choices have infection reducing properties, along with helping blood clotting in a bone graft, thus allowing the bone graft material to hold together and develop the necessary density. Very few traditional dentists or oral maxillofacial dental surgeons use the materials Dr. May utilizes as his choice of materials require more time, effort and cost on the part of the dentist, relative to the most widely used animal or synthetic bone graft material made of either animal material (bovine or porcine) or synesthetic compounds, including various forms of PTCP (beta-tricalcium phosphate). Dr. May’s grafting material is extremely effective, beneficial and safe because it is made from patients’ very own blood thus making it 100% natural, derived from patients’ own bodily tissue. The blood is spun down into a serum with white blood cells and healing properties and used as the perfect grafting matrix regenerating dense, healthy and incredibly robust bone growth, which is the goal of a bone graft. The materials described below have been very well studied and documented for many years. Dr. May’s patients experiencing the largest bone grafts in the case of sinus lifts and large cavitation grafts typically only need a mild pain reducer such as Advil or Tylenol after undergoing the procedure if they have had a dental bone graft with any of the below materials. Dr. Yuriy May has an extremely high success rate in rebuilding and transplanting bone for dental implants and for full mouth reconstruction cases, including post-dental cavitation procedures. Traditional Bone Grafting Materials There are currently procedures to save or preserve bone, and there are a number of conventional bone graft materials available to be used with these procedures in dentistry today, all of which are suboptimal in holistic dentistry as they use the foreign material to create a matrix to rebuild a dental patients’ oral and facial bone structure. They include: Autograft: Recipient’s Own Bone Autograft is obtaining of bone from the patient’s own body and typically is the gold standard grafting procedure available now. Concerns: Autograft has its limitations, which include potential problems such as second surgical site and patient discomfort in terms of harvesting of a graft from another part of the patients body. It’s also a painful, complex and costly procedure for the patient. Allograft: Bone from another Human Being Allograft is obtaining of bone graft materials from human cadavers. Concerns: The disadvantage of allograft is that the bone graft materials may be rejected by the recipient’s immune system. Also there is chance of disease cross transmission. Xenograft: Bone from animal, usually porcine or bovine origins Xenograft is the obtaining of bone graft materials from tissue of animal origin, which includes bovine (cow’s bone) or porcine (pig’s bone) Concerns: Similar to allograft, such bone graft materials may be rejected by the recipient’s immune system or pose concerns of potential disease transmission. Alloplast: Synthetic grafting materials Alloplast are synthetic grafting materials used for grafting. Concerns: They have limitations in terms of biocompatibility, resorption timing, local tissue reaction, and bone regeneration. 1. Depprich R, Zipprich H, Ommerborn M, et al. Osseointe- gration of zirconia implants compared with titanium: an in vivo study. Head Face Med. 2008;4,1–8. 2. Hoffmann O, Angelov N, Gallez F, Jung RE, Weber FE. The zirconia implant-bone interface: a preliminary histologic evaluation in rabbits. Int J Oral Maxillofac Implants. 2008;23:691–695. 5. Oliva J, Oliva X, Oliva JD. One-year follow-up of first consecutive 100 zirconia dental implants in humans: a comparison of 2 different rough surfaces. Int J Oral Maxillofac Implants. 2007;22: 430–435. 6. Silva NR, Coelho PG, Fernandes CA, Navarro JM, Dias RA, Thompson VP. Reliability of one-piece ceramic implant. J Biomed Mater Res B Appl Biomater. 7. Andreiotelli M, Kohal RJ. Fracture strength of zirconia implants after artificial aging. Clin Implant Dent Relat Res. 2009;11: 158–166. 8. Heydecke G, Kohal R, Glaser R. Optimal esthetics in single tooth replacement with the Re-Implant system: a case report. Int J Prosthodont. 1999;12:184–189. 9. Bianco PD, Ducheyne P, Cuckler JM. Local accumulation of titanium released from a titanium implant in the absence of wear. J Biomed Mater Res. 1996;31:227–234. 10. Weingart D, Steinemann S, Schilli W, et al. Titanium deposition in regional lymph nodes after insertion of titanium screw implants in maxillofacial region. Int J Oral Maxillofac Surg. 1994;23:450–452. 11. Tschernitschek H, Borchers L, Geurtsen W. Nonalloyed titanium as a bioinert metal – a review. Quintessence Int. 2005;36: 523–530. 12. Kohal RJ, Wolkewitz M, Hinze M, Han JS, Ba ̈chle M, Butz F. Biomechanical and histological behavior of zirconia implants: an experiment in the rat. Clin Oral Implants Res. 2009;20:333–339. 13. Andreiotelli M, Wenz HJ, Kohal RJ. Are ceramic implants a viable alternative to titanium implants? A systematic literature review. Clin Oral Implants Res. 2009;20(suppl 4):32–47. 14. Sandhaus S. The Cerasand endosseous implant. Actual Odontostomatol. 1987;41(160 Spec No):607–626. 27. Kohal RJ, Klaus G, Strub JR. Zirconia-implant-supported all- ceramic crowns withstand long-term load: a pilot investigation. Clin Oral Implants Res. 2006;17:565–571. 28. Hisbergues M, Vendeville S, Vendeville P. Zirconia: Estab- lished facts and perspectives for a biomaterial in dental implantol- ogy. J Biomed Mater Res B Appl Biomater. 2009;88:519–529. 29. Depprich R, Zipprich H, Ommerborn M, et al. Osseointe- gration of zirconia implants: an SEM observation of the bone- implant interface. Head Face Med. 2008;4:1–7. 30. Stadlinger B, Hennig M, Eckelt U, Kuhlisch E, Mai R. Comparison of zirconia and titanium implants after a short healing period. A pilot study in minipigs. Int J Oral Maxillofac Surg. 2010;39: 585–592. 31. Piconi C, Maccauro G. Zirconia as a ceramic biomaterial. Biomaterials. 1999;20:1–25. 32. Piconi C, Maccauro G, Muratori F, Brach Del Prever E. Alumina and zirconia ceramics in joint replacements. J Appl Biomater Biomech. 2003;1:19–32. 33. Helmer JD, Driskell TD. Research on bioceramics. Sympo- sium on Use of Ceramics as Surgical Implants, 1969. Clemson University, Clemson, SC. 35. Gahlert M, Burtscher D, Grunert I, Kniha H, Steinhauser E. Failure analysis of fractured dental zirconia implants. Clin Oral Implants Res. 2012;23:287–293. 36. Mellinghoff J. First clinical results of dental screw implants made of zirconium oxide [in German]. Z Zahnarztl Implantol. 2006; 22:288–293. 37. Kollar A, Huber S, Mericske E, Mericske-Stern R. Zirconia for teeth and implants: a case series. Int J Periodontics Restorative Dent. 2008;28:479–487. 38. Sollazzo V, Pezzetti F, Scarano A, et al. Zirconium oxide coating improves implant osseointegration in vivo. Dent Mater. 2008;24:357–361. 39. Rocchietta I, Fontana F, Addis A, Schupbach P, Simion M. Surface-modified zirconia implants: tissue response in rabbits. Clin Oral Implants Res. 2009;20:844–850. 40. O ̈ zkurt Z, Kazazog ̆ lu E. Zirconia dental implants: a literature review. J Oral Implantol. 2011;37:367–376. 41. Sennerby L, Dasmah A, Larsson B, Iverhed M. Bone tissue responses to surface-modified zirconia implants: a histomorpho- metric and removal torque study in the rabbit. Clin Implant Dent Relat Res. 2005;7(suppl 1):S13–S20. 42. Meyer U, Buhner M, Buchter A, Kruse-Losler B, Stamm T, Wiesann FI. Fast element mapping of titanium wear around implants of different surface structures. Clin Oral Implants Res 2006;17:206-11. 43. Weingart D, Steinemann S, Schilli W. Titanium deposition in regional lymph nodes after insertion of titanium screw implants in maxillofacial region. Int J Oral Maxillofac Surg 1994;23:450-2. 44. Frisken KW, Dandle GW, Lugowski S, Jordan G. A study of titanium release into body organs following the insertion of single threaded screw iplants ino the mandibles of sheep. Aust Dent J 2002;47:214-7. 45. Schliephake H, Reiss G, Urban R, Neukam FW, Guckel S. Metal release from titanium fixtures during placement in the mandible: An experimental study. Int J Oral Maxillofac Implants 1993;8:502-11. 46. Piconi C, Maccauro G, Muratori F, Prever BD. Alumina & zirconia ceramics in joint replacements. J Appl Biomater Biomech 2003;1:19-32. 47. Griss P, Von Adrian-Werburg HV. Biological activity & histocompatibility of dense Al 2 O 3 -MgO ceramic implants in rats. J Biomed Mater Res 1973;7:453-62. 48. Harms J, Mausle E. Tissue reaction to ceramic implant material. J Biomed Mater Res 1979;13:67-87. 49. Garvie RC, Urbani C, Kennedy DR, Mcheuer JC. Biocompatibility of magnesia-partially stabilized zirconia ceramics. J Mater Sci 1984;19:3224-8. 50. Chaturvedi, TP. “Allergy Related to Dental Implant and Its Clinical Significance.” Clinical, Cosmetic and Investigational Dentistry 5 (2013): 57–61.